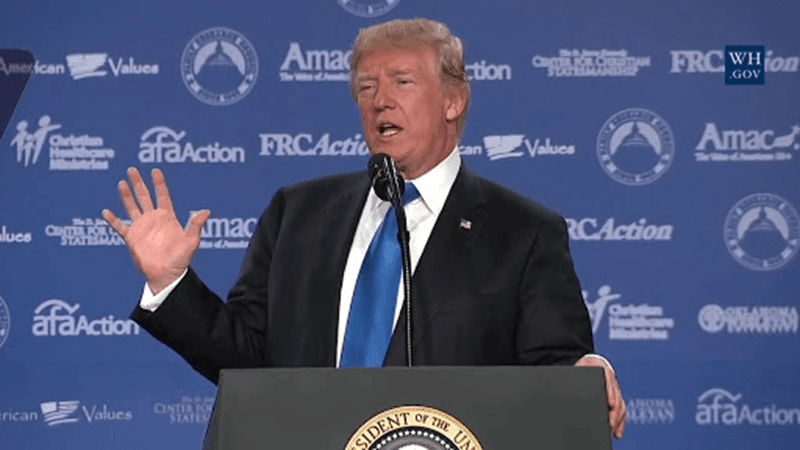 President Trump addressed this year's annual Values Voters Summit in Washington, D.C. He is the first sitting U.S. president to do so. But there was one issue critical enough to drive their support — replacing Supreme Court Associate Justice Antonin Scalia with another judge of equally stellar conservative credentials. He recently opened the door for employers with religious objections to bail out of the Obamacare requirement of providing birth control devices and pills to employees free of charge. Trump's clear support of Israel — he was also the first sitting American president to visit Israel in the early months of his presidency and to visit the Western Wall in the old city of Jerusalem — appeals to Evangelicals. And the recent announcement by the Trump administration that the United States will withdraw from the anti-American, anti-Israel United Nations agency UNESCO. Most in America's evangelical communities, including substantial numbers of black evangelicals, were appalled when Obama moved to support LGBTQ secularism, even lighting up the White House in rainbow flag colors. Equally appalling to evangelicals was Obama agreeing to be the first sitting American president to address the annual meeting of Planned Parenthood, America's largest abortion provider, concluding his address to these abortionists with, "God bless you." Addressing this conservative Republican base is what Trump took on in his Values Voters speech. He conveyed what our Founding Fathers understood — that a free society needs morality and morality needs religion, a nation under God.